I will be writing a longer piece on ATOMIC BLONDE as soon as I see it again. How it ends flipped what I thought of chunks of the plot so I now have to go through again knowing how it ends to see what I really think. Until then here are some thoughts. A brutal vicious face unch of an action film. Its a film that leaves a bloodstain on the screen and in the first couple of rows as the violence smacks the audience in the face. I've been told by several people that the film doesn't make sense, but it does if you pay attention and if you realize that the narrative is flipping. This is a typical you don't know what is happening until the end spy film which most Americans are not used to since Hollywood simplifies so much. The film is a brutally violent film where the characters bruise and stay bruised. 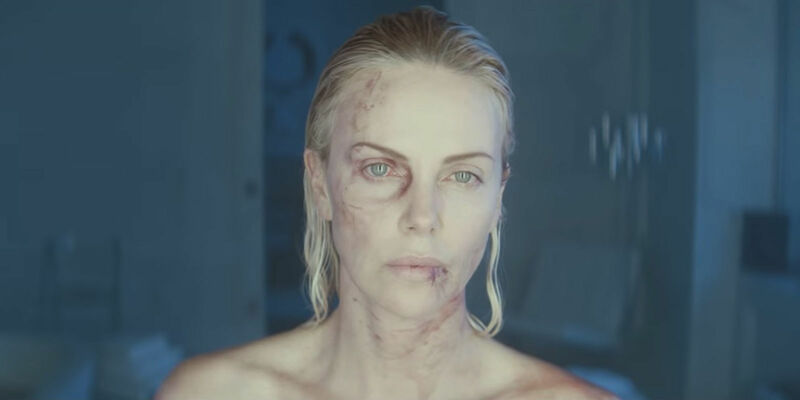 Theron's face at one point swells ugly and if the swelling goes down later in the sequence you have to give them points for showing the ugly side of things. And almost all the violence is ugly as people are beaten and stabbed in horrible ways. Bullets sometimes miss their mark and people bleed out. Its wickedly cool make believe but the real world implications are horrifying. Theron shines in the lead. Double check she's on the list of greatest living actresses. She makes you feel and she makes you believe what ever she is doing. The use of music is stunning. The song choices are brilliant from Peter Schilling's Major Tom Schilling to Til Tuesday's Voices Carry or the ironic us of 99 Luftballons (and later sadness), the music drives the film to unexpected heights. I love this film and I want to discuss it in detail but right now I can'y. What I want to say would be way too spoilery. Additionally I'm still working out the final twists and turns. I'm still not 100% sure of a a couple of things and I want to work them out in a second viewing. Until then go see the film. Strap in and take your ride and prepare to be rocked.